I filmed the next video of my Absolute Beginner Tatting Series today, and as I was making it a question arose that I would like your feedback on. The video is on how to block a large project, and I’m using a doily to demonstrate, so I was pinning it down, and putting in more pins, and even more pins, and row after row of more and more pins. Well, this kinda took a long time, and, yeah. Do you really want to watch all that? So here is my question: Do you want me to give you the full video, so you can see all the details and the entire process of pinning from start to finish, or do you want me to edit out most of the repetitive pinning and just show the highlights? 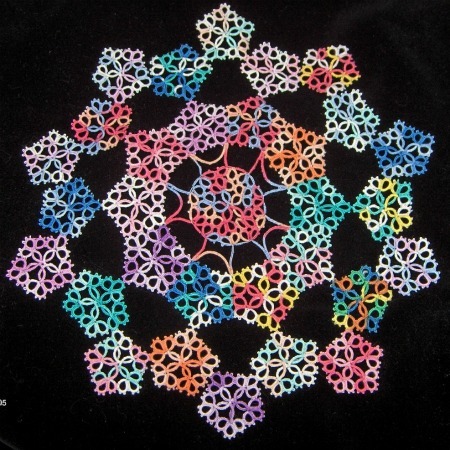 I’ve seen several posts on the tatting forums where people are asking for precisely this—a start-to-finish video showing the whole blocking process. That said, the video is currently 33 minutes long. A lot of that is highly repetitive and dull, if not downright boring. Sure, you can fast forward plenty, but do you seriously want that video? Or I could edit a lot of it out and just show you the important parts. But if I do that I don’t want any complaints that “you didn’t show the whole thing.” Whine. Blah. Nope, not listening. Give me your feedback; tell me what you want and like a good pizza I’ll deliver. 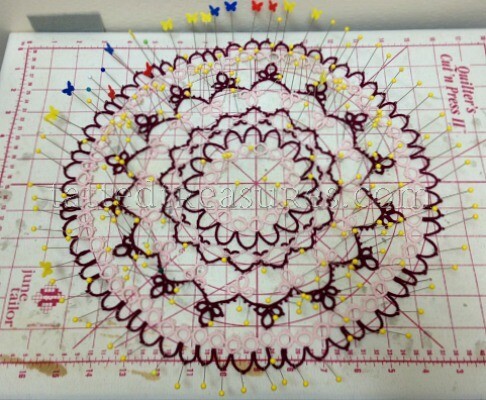 Can you guess how many pins went into blocking this doily? Leave a comment with your best guess (only one guess per person, please) and the closest guess will get a small prize. The guess, not the person. Hehe. Highlights would be fine for me, but I’ve been blocking doilies for years, so I’m probably not the best person to give an opinion. 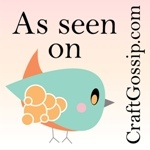 ok, my guess is 190. and maybe you could edit it to fast forward through the pinned, like your super pinner? My guess is 245 pins, and I think that the highlighted on the pinning would be fine. 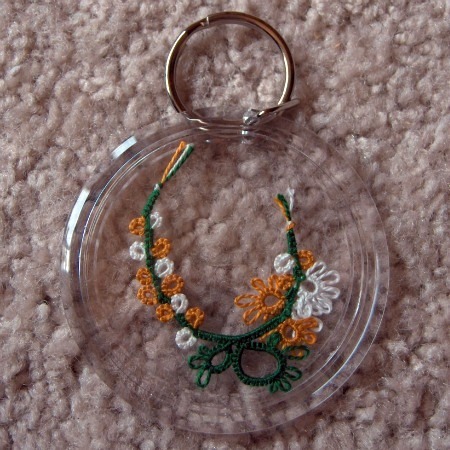 Maybe just wording that states that all circles and chains need to be pinned for shaping. 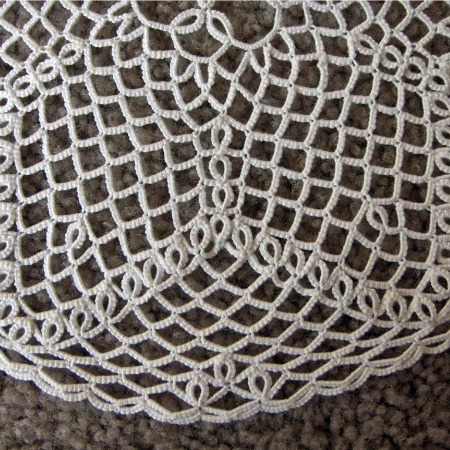 The picture of the doily pinned should be enough to show how much. I think showing the highlights would be great. So far it seems that the highlights seem preferable. Any other thoughts? Good guessing so far…don’t take that as a confirmation that the guesses are right (or wrong), as I have no idea. I’ll count the pins when I take them out. Any more guesses? This is fun! Does it have to be either or? If you produced two versions of the video, a long and a short, they might both be appreciated by different people. I think it’ll be good to show at least how to align the doily, how the pins should follow the lines, then the first row of pinning, followed by fast forward to the the middle and last rows (showing excerpts). oooh, my guess is 148 pins! I think highlights would be fine for the video, as long as you showed some details about how to begin. Having never stiffened a large project, that is the part I am most interested in. And my guess is 189. Have you seen any of the “This is handmade” videos? http://thisishandmade.tumblr.com/ is where you can learn more about it. But as for some “real” advice on the video. I personally would probably just fast forward through a “boring video”… that’s just how I am. Would it be possible to block a smaller piece so that people can see the whole process in one video? Anyway, I guess 180 pins. I think highlights would work just fine. 207? I would think there are 260 pins. Thank you for the pictures. I have to agree, I think showing how to pin is very important but just to do the first few rows and hit the highlights and then show the how it should look when all done is all you need to really show. As a beginner I think most of us should be able to understand the process. So how many pins did you use? By the way, I love how you did the video. Some slow, some fast, then finished it off. Good job. Tatting Tip: Too Scared for Two Shuttles?